Highways England has this afternoon confirmed that the slip road onto the A1M southbound from Fletton Parkway will remain closed 24 hours a day for two weeks. A spokesperson for Highways England has not answered questions about why a previous statement to the press and public only mentioned night-time closures and not 24\7 restrictions. The legal public notice printed in the Peterborough Telegraph on Thursday June 15 (page 82) does mention “24 hour closures at times” but adds that this will be restricted to weekends only. A Highways England spokesperson said: “Essential maintenance work on the A1(M) between Huntingdon and Peterborough started on Friday 16 June and is going to plan. The work is needed as the surface on this busy road is reaching the end of its serviceable life. “We are not just resurfacing this stretch but restoring the road surface as new, which will help minimise the need for maintenance for a long time once work has been completed. “We publicised this vital work in advance and are making sure that any restrictions are accurately reported through traffic information and journey planning services like Sat Nav providers and Traffic England, which we also update in real time to help people plan their journeys ahead of setting out. * The work requires a mix of overnight road closures on the A1(M) southbound between 9pm and 7am at various times until the work is complete in August, and a full closure of the junction 17 and 16 entry slip roads 24/7 from 17-30 June. 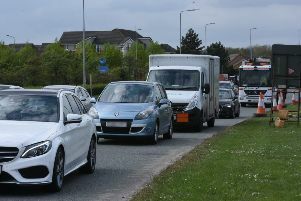 * Highways England is working in close collaboration with Cambridgeshire County Council to see what additional measures can be put in place to help relieve congestion. * Did Highways England consult with Peterborough City Council about the ongoing roadworks on the A15? * Why was a press release put out last week with mention of nighttime closures but no mention of 24\7 closures? * When were the plans changed and why was the public not informed? Highways England have so far chosen not to respond to these questions despite having been asked them by our journalists on several occasions throughout Monday June 19.